•Determines the number of instances according to the number of items contained in the collection. •Creates all the Sub-Process instances at the same time, in Parallel. •Waits for all the created Sub-Process instances to finish, before allowing the parent Process flow to continue. You can modify the default settings by means of the Advance options presented in the Multiple Sub-Process Wizard. The Advanced settings will allow the user to configure different business cases. 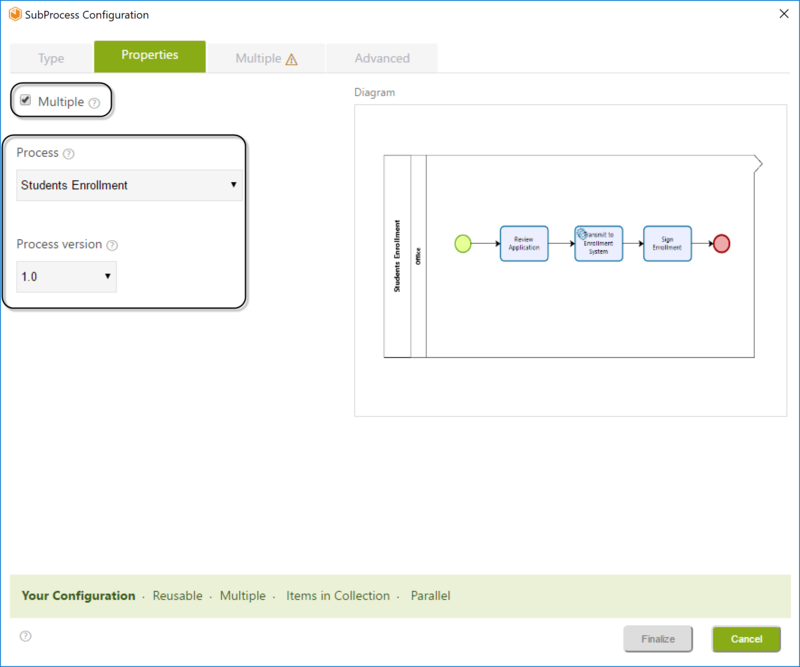 To illustrate the Basic Multiple Sub-Process configuration we will continue to use the Students Application Process described in the previous section. In the example the parent Process is called Students Application and contains a Multiple Sub-Process called Student Enrollment. 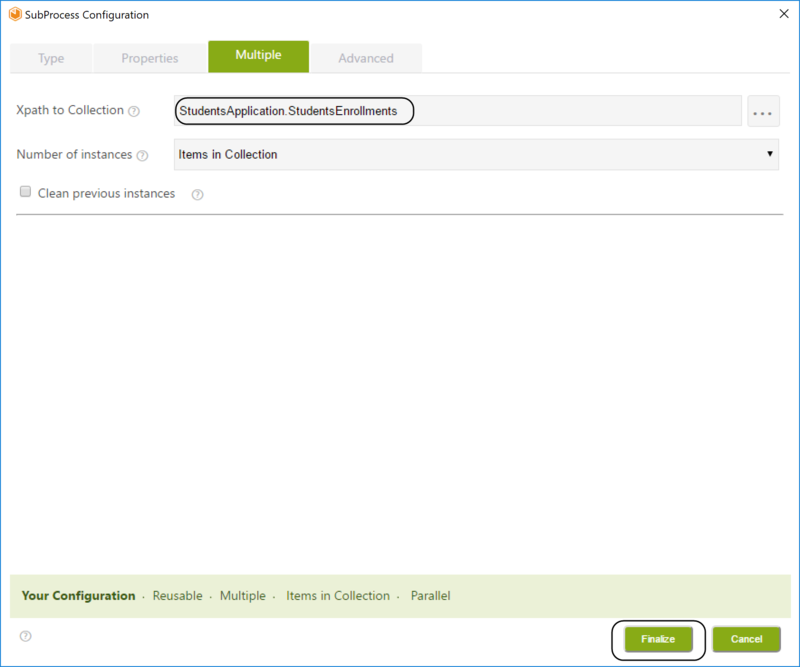 •Create as many instances of the Student Enrollment Sub-Processes as records found in the collection related to the parent Process Entity. 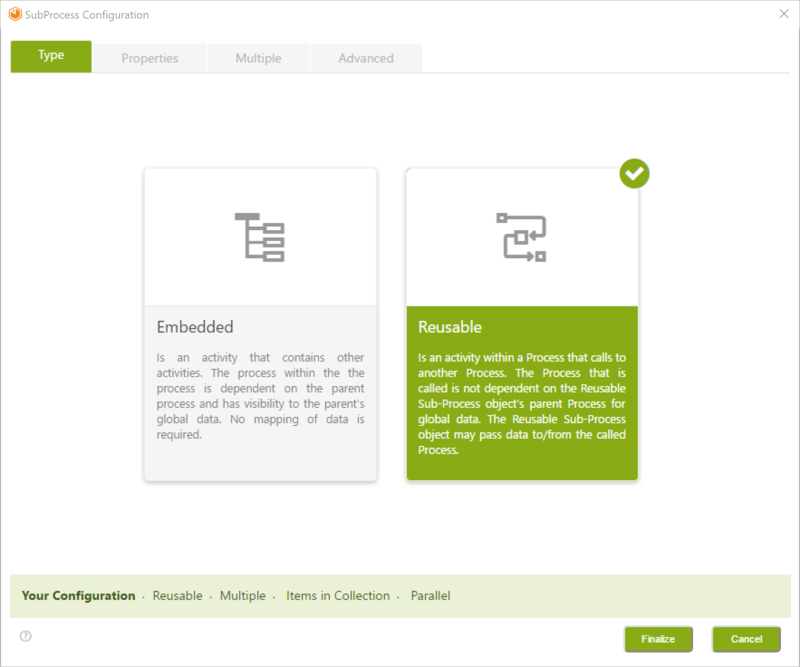 •Create the Sub-Process instances in parallel to allow for non-sequential enrollments. •Terminate the students application Process when all the enrollments have finished. Students Application is the Process Entity of the Students Application process and Students Enrollment is the Process Entity of the Sub-Process Students Enrollment. Note when a one-to-many relationship between two entities is created, an attribute is automatically created in the Collection Entity (many) relating it to the Parent Entity (one). This attribute (StudentsApplication.StudentsEnrollment) is the key to access to the parent process attributes starting from the Sub-Process context. This diagram shows the parent Process before the Multiple Sub-Process is created. 1. Go to step 1 (Model Process) of the Process Wizard and click Edit Process. Select the parent Process called Students Application. 2. In the model diagram, right-click the Task you wish to convert, in this case Students Enrollment, and select the option Transform to Sub-Process option. 3. A new window will display the Sub-Process types. Select the Reusable option. Sets the Sub-Process as Multiple. When selected, it disables the add button control of the reusable Sub-Process, so you must select an existing process. Displays the selected process versions list and sets the selected one as the Sub-Process version. Displays a preview snapshot of the selected process model. Presents the Sub-Process status configuration horizontally. 5. Click the drop down list and select the process desired. Then, click the Process version drop-down list and select the desired one. 6. 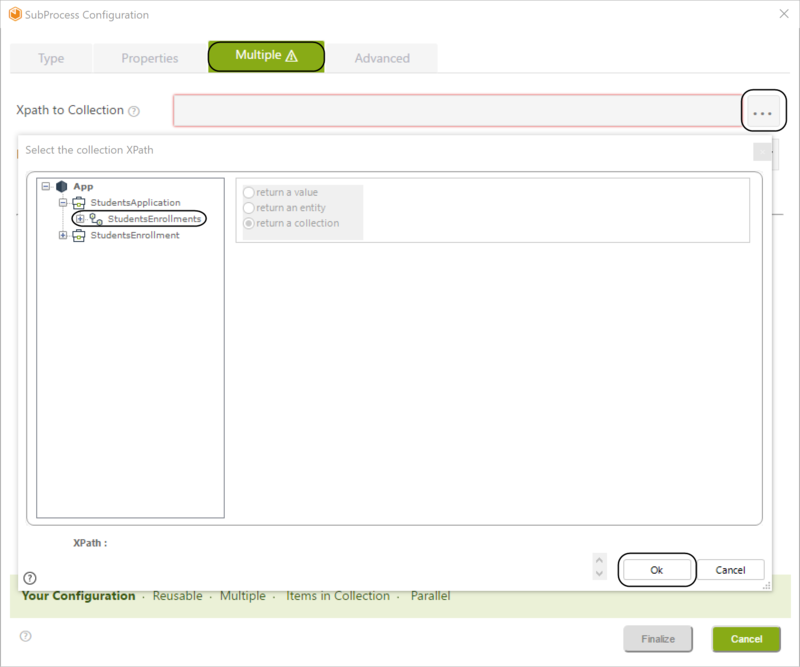 Click the Multiple tab and select the Collection Xpath. 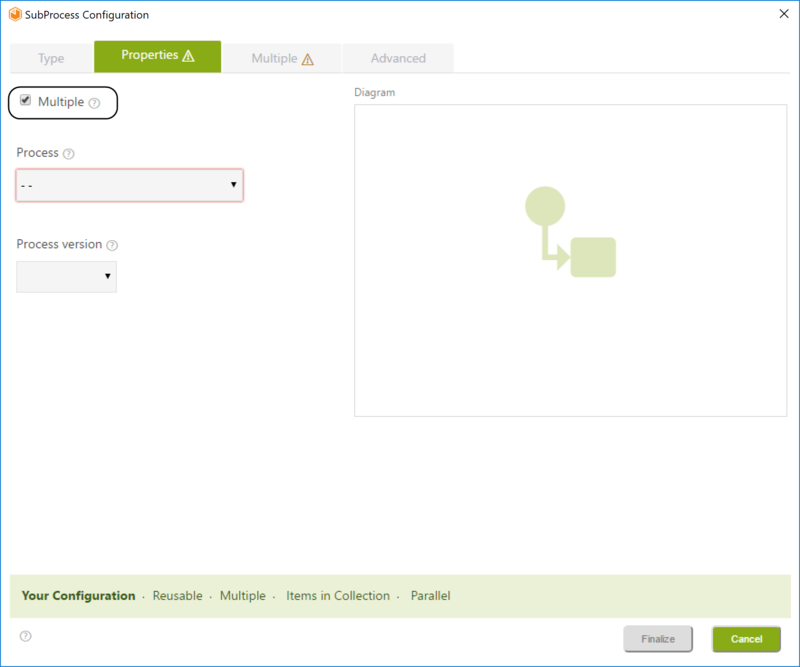 This is the Xpath that relates the Parent entity with the Collection entity from which the instances of the Multiple Sub-Process will be created. In this case, it will be: StudentsApplication.StudentsEnrollments. There will be as many Sub-Process instances as there are objects found in the Students Enrollment Collection. 7. Click the Finalize button. Remember that for defining a Multiple Sub-Process, the process diagram must be previously created in the Wizard. Both the parent Process and Sub-Process must have a Process Entities defined. Your Students Enrollment multiple Sub-Process has been successfully configured.